Another month, another favourites post. This year is just flying by! 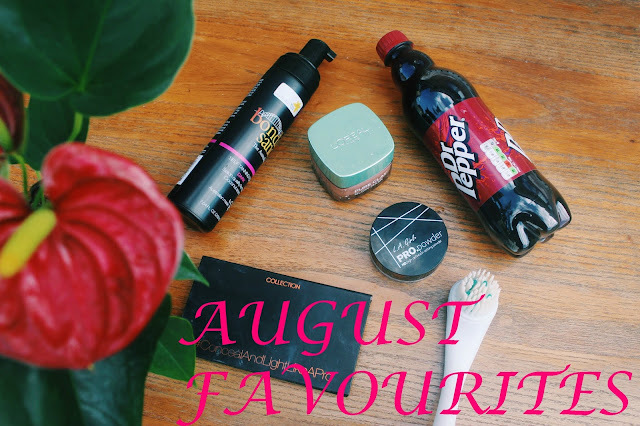 It was kind of tricky to think of things I’ve been loving this month because I haven’t tried many new things – and the new things I have tried were last week so I can’t really decide whether they’re favourites worthy or not. But anyway, here we are and I’ve got a few things to talk through today! I had been searching for a good translucent powder for a long time so that I could actually try baking (which is bloomin’ difficult) so whilst mooching on Beauty Bay a few weeks ago I came across this. I love this stuff; before I discovered my beauty blender could be used for baking I would just put a little bit of this onto my powder brush and dust it all over my face. It makes me look flawless. Literally. And it lasts ALL DAY. No shine is coming through this bad boy. It’s quickly overtaking Rimmel Stay Matte as my favourite powder. The best thing is that it was only £5!!! I may do a post on how I bake my face when I actually learn how to do it a bit better, let me know what you think! I’ve read a LOT of amazing posts about these face masks, I’m so desperate to get my hands on the Detox mask but it’s always sold out! I do love this one though – I use it on my forehead and cheeks and use the face mask from my AUGUST GLOSSYBOX on my chin and any other spots I have. I think the combination of these two have been instrumental in my being so close to achieving my perfect skin. It smells like your very standard face mask, but this one has little beads in it so it exfoliates as you wash it off! It was only £5 as well, I hope these stay on offer because if I don’t grab a Detox mask soon I may scream. I actually bought this quite a few months ago but had no idea how to use it until reading SARAH’S POST and then I dug it back out to give it another try. Also, would just like to apologise for how grubby it is, I literally use it every day and it shows. If I had cleaned it I’d just be deceiving you all and I ain’t about that life. I apply the green to my blemishes and the yellow underneath my eyes after my primer, but before my foundation, and I actually find that I don’t need any concealer on my blemishes after blending my foundation. All I need is a bit more under my eyes and I’m good to go! I just bought a new concealer palette from Revolution so let me know if you want me to do a bit more in depth post on my colour correcting routine! This was another Glossybox find – and I am OBSESSED. This little thing is amazing. I use this twice a day with one of my cleansers as a second cleanse and then follow it with a third cleanse (too much? Never.) and my skin is radiant and smooth and amazing. It’s not too harsh on my skin at all either, the only problem is I doubt this will last very long. It is just a little plastic brush thing but at £6.99 it definitely won’t break the bank to replace! I feel like this is a weird thing to included but I didn’t want to let it be all beauty/skincare. And I am obsessed with this. More so this month thanks to IMOGEN and her obsession – I need one near me at all times or I’m just not happy. Previous Post WHAT DOES GIRL POWER MEAN TO ME?